NYNJA makes it super easy to find and add contacts. From the home screen, open the wheel to find contacts. From here, choose one of several options to add a contact that either are already on NYNJA or have not yet registered. Search by Username: Contacts already registered with NYNJA will be searchable by their NYNJA username and can be added from the results screen. Search by Number: Contacts already registered with NYNJA will be searchable by phone number and can be added from the results screen. Add a Contact by QR Code: All NYNJA users have a QR code that corresponds to their account. 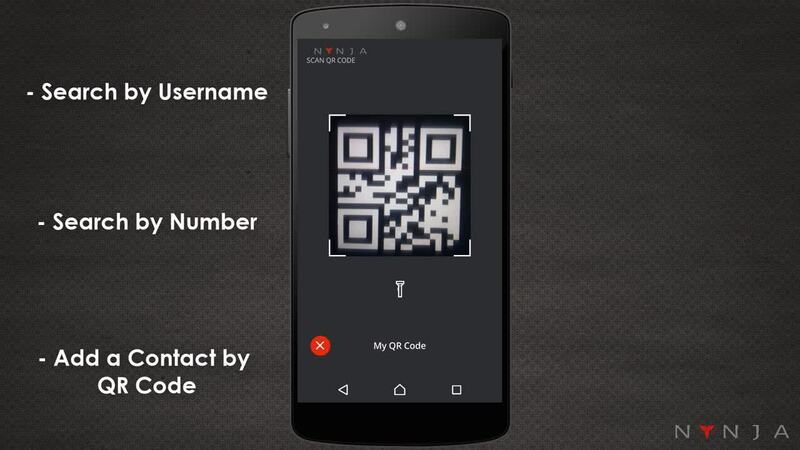 With this method, you can scan an existing NYNJA user’s QR code or share your own for them to scan to be connected instantly. Add Phonebook Contacts: You can add your existing contacts from your phonebook. Invite New Contacts to NYNJA: You can also invite new users to NYNJA through an SMS invitation. Share Contacts: If one of these methods doesn’t work, you can ask one of your existing contacts to share the contact card of the person you wish to connect with.